Italvacuum specialises in the design, manufacture and supply of vacuum pump and dryer solutions for chemical applications. The leading product of the company’s drying technology range is the CRIOX System, which has achieved international success with more than 400 units currently installed in 30 countries worldwide. The CRIOX System consists of a multiproduct rotary vacuum dryer / pulveriser that is able to perform complete extraction of solvents from wet powders coming from filtering or centrifuge. The process can be carried out with intermediates, active pharmaceutical ingredients (API), fine chemicals, and finished products that are thermo-sensitive, delicate, degradable, photosensitive, sterile, injectable, or chemically reactive. 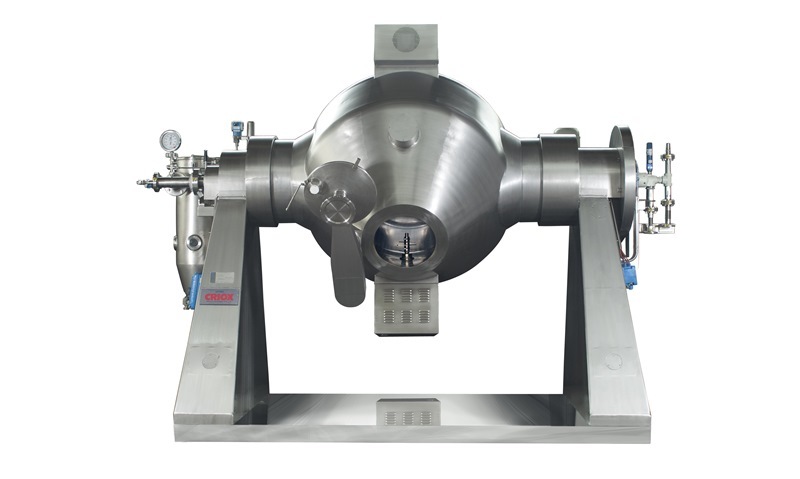 The CRIOX System can be used as an effective fast blender or homogeniser, as well as a granulator, limiting the subsequent use of the mill as much as possible. As well as being versatile and profitable, the system is designed to take a minimal time to re-establish the line, as well as to wash, clean, and inspect the plant, which allows for rapid shift from one product campaign to another. The CRIOX System is safe for both plant personnel and the environment, as it has been designed and built in compliance with the ever more stringent safety regulations and with current good manufacturing practice (cGMP) and ATEX standards. It also meets the highest hygienic standards according to the US Food and Drug Administration (FDA). On request, the system can be designed in compliance with European Hygienic Engineering and Design Group (EHEDG) guidelines. Due to its bi-conical rotating drying chamber, the CRIOX System allows total and continuous revolution and an extremely homogeneous mixing. The chamber rotation speed is adjustable from very gentle to moderate, meaning even products with weak bonds can be treated without modifying molecular structure. During the drying process, the CRIOX System crushes blocks inside the mass and breaks down lumps, forming dry powders that are ready to be riddled and packed, with a controlled final particle size distribution. The bi-conical shape of the rotating chamber and two powerful electrical lump-breaking blade sets increase the surface area of the product. By acting on the core of the product, the electric lump-breaking units consistently reduce the drying time, ensuring extremely low moisture levels. In addition, they allow operation at low working temperatures for the benefit of the purity of the most delicate thermo sensitive products, as it avoids degradation. The lack of pneumatic circuits prevents lump-breakers from pressurised air inside the chamber and the surrounding area. Regarding constructive materials, the standard CROIX System is made of stainless steel AISI 316L (1.4404), but may be made from other weldable materials such as LLOY C-22 (2.4602) and AISI 904L (1.4539) on request. Characterised by soft lines without edges and sharp corners, the system includes an internal coating made of particular fluorine-polymer materials, characterised by a high-resistance against products containing extremely corrosive substances (acids and bases). In vacuum drying processes, the filtering unit must be able to keep all the powder in the chamber, letting only the solvent vapours pass through. At the same time, it must ensure the lowest possible pressure drop to achieve very low final pressure values. Italvacuum offers special filtering systems, placed inside the drying chamber, which meet all process requirements including metal sintered cartridge filters or Polytetrafluoroethylene (PTFE) filters. Filter effectiveness during the process is ensured by an automatic clean-in-place (CIP) system for nitrogen back-flow washing. The rotation of the drying chamber and the combined action of the lump-breaking units means the unit only requires a few rinses to be cleaned to the parts per million (ppm) values required by the FDA standards. This reduces the quantity of wastewater. In addition, a CIP device can be applied inside the chamber to spray the washing fluid in all directions. The lump-breaking units blades can be easily dissembled due to their small size. The filtering system can also be dismounted using a special key without difficulty. Internal inspection is facilitated by the opening manhole port lid and the loading hopper. To perform swab tests required by the FDA for the validation of the washing procedures, Italvacuum designed and patented a large hatch so the machine can be completely opened. In addition, external cleaning is easy and effective. Sealed external cladding (particle-free configuration) covering insulation, electrical, hydraulic, and pneumatic circuits avoid product deposits in recessed areas. This feature also allows the partitioning solution, which allows for the cleanroom and machine room to be separated. The CRIOX System is designed to fulfil the widest possible range of needs, being manufactured with capacities from 55l to 12,000l. The maximum load level depends on the product to be processed. Conversely there are no constraints on minimum batch size, since the mechanical action of the lump breaker units is effective even with a few litres of product. Control panel with a programmable logic controller (PLC) for the management of operative parameters and the drying processes. For drying trials on the customer’s products, Italvacuum has a wide range of pilot installations for semi-industrial and laboratory tests. During trials with pilot installation, it is possible to extract product samples without breaking the vacuum and vary process parameters to define the ideal drying path. In this way the customer can make the best choice for the Italvacuum installation both in terms of dimension and performance. Trials are completed and formalised by drawing up a detailed report.